Glimmering through a dusty nebula that surrounds the Pleiades star cluster is the faint spiral galaxy UGC 2838, visible in the bottom-right corner of this photo by astrophotographer Miguel Claro. Miguel Claro is a Lisbon, Portugal-based professional photographer, author and science communicator who creates spectacular images of the night sky. As a European Southern Observatory photo ambassador, a member of The World At Night and the official astrophotographer of the Dark Sky Alqueva Reserve, he specializes in astronomical "Skyscapes" that connect Earth and the night sky. Join him here as he takes us through his photograph "The Dust of Pleiades Star Cluster and a Faint Spiral Galaxy." A faint spiral galaxy lurks in deep space in this stunning view of the Pleiades star cluster. The Pleiades (Messier 45) is an open star cluster in the constellation Taurus that contains middle-age, hot B-type stars. 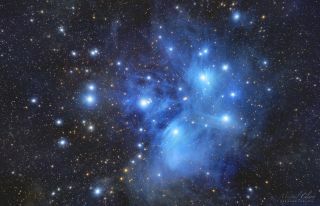 It is among the nearest star clusters to Earth, and the brightest stars of the Pleiades — known as the Seven Sisters — can be spotted easily with the naked eye. More than 1,000 stars reside in the Pleiades, of which more than a dozen can be seen without telescopes or binoculars. The blue cloud of interstellar dust and gas surrounding the cluster is a reflection nebula that glows with faint light reflected from local stars. Dust around the brightest stars of the Pleiades was initially thought to be leftover star ingredients from the formation of the cluster and was informally named the Maia Nebula, after the fourth-brightest star in the cluster, Maia. Astronomers now think the dust is unrelated to the stars' formation. Instead, it appears to be just another nebula in space that the cluster happens to be passing through, according to NASA's Astronomy Picture of the Day. The Pleiades cluster is dominated by hot, blue and extremely luminous stars that have formed within the past 100 million years and are located 391 light-years away, according to measurements made by the Hipparcos satellite. An annotated version of the same image by Miguel Claro shows the location of the spiral galaxy UGC 2838 and labels nine of the brightest stars in the Pleiades cluster. In the same field of view, though less obvious than the brightest hot stars of the Pleiades, near the star Electra (to the right) lies the very faint spiral galaxy UGC 2838 (also known as PGC 13696). Barely glowing, with a magnitude of 17.8, this galaxy is beyond the limit of our human capacity to distinguish faint objects in the night sky, but it can be detected by many small telescopes and binoculars. If you are a night-sky photographer and have already pointed your camera to this well-known star cluster, see if you can find this stealthy galaxy in your own pictures. To shoot this photo, I used a Takahashi FSQ-106ED refractor with a 1.6x Extender-Q, an EM-200 auto-guided mount and a Nikon D810A DSLR astrophotography camera. The image combines 38 exposures and 2 hours and 48 minutes of exposure time. First, the camera was set to capture with an ISO setting of 2500, shooting 300-second exposures 15 times. Ten more frames used an ISO setting of 3200 to shoot 210-second exposures, and the last 13 frames were shot with ISO 2500 and an exposure time of 270 seconds. To process the final product, I used PixInsight 1.8 and Photoshop CS6. The photo was taken from the Cumeada Observatory at the Dark Sky Alqueva Reserve in Reguengos de Monsaraz, Portugal.